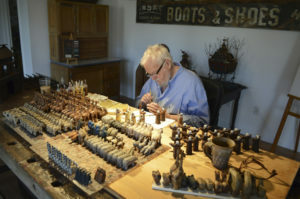 Maurice “Mo” Dallas has been involved in the American Folk Art revival (circa 1976) for nearly forty years. Mo has worked in many media’s including structural clay, iron stone pottery, spatterware reproductions, metal and cast stone sculptures and calendar illustrations. In 1982 Mo Dallas created the Millwood Toy Co. a production company manufacturing primitive noah’s ark toys, products designed specifically for the popular wholesale folk art market. Mo designed another folk art line known as Bird n Tree Pholk, this collection featured hand crafted products that included whimsical bird houses, lamps, clocks, and mirrors. In 1995 Mo and his wife Kelly began creating one of a kind Noah’s Arks, these arks included hand carved animals and characters. These original Ark works are appreciated by serious collectors, museums, and galleries. During the last ten years “Mo” Maurice & Kelly Dallas have produced over one thousand original arks. The only exception to the one of a kind arks are the very special certified limited edition pieces. The fervent love of Noah’s ark still exists, and Mo’s creations captivate children and adults alike. Whether you are charmed by the elegant, classic arks (in the essence of antique German arks of the 1850’s) or those more whimsical in nature, his works are indeed keepsakes. Even in the conceptual stages, Mo gives meticulous attention to detail and the continuity of shapes and hues. Through the years Mo’s GoodBook Folk Ark creations have expanded to include angels, Noah’s ark theaters, zoo’s and Noah’s seaside extravaganza ships. Mo and Kelly accept personal commissions, these Sunday toys are personalized upon request and original conceptual drawings are included. These products are still created and produced in our home studio one at a time.